Hi, everyone! I’m Laura. I blog at Peace but Not Quiet about kids’ activities, recipes, and parenting. 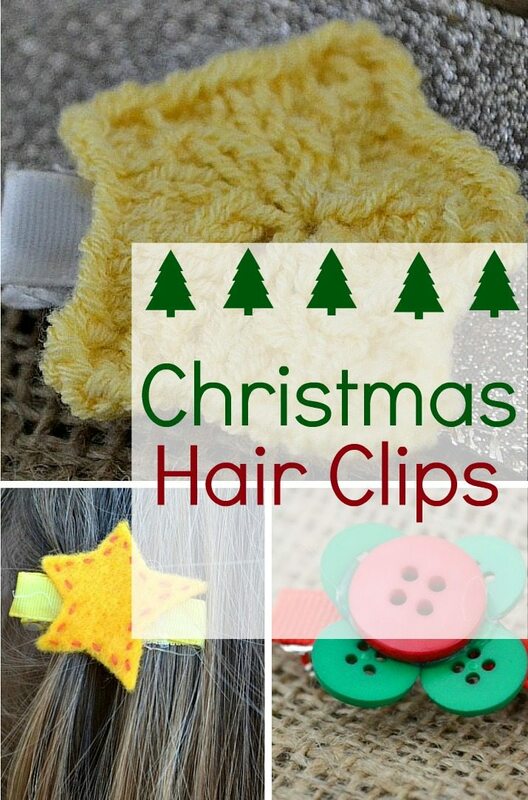 I’m excited to be sharing our Christmas hair clips here today — thanks, Kelly! I think hair barrettes are an easy, fun way to get festive without requiring a lot of time or money. With a few simple supplies on-hand, you can make ’em up for any holiday. I bought a large bag of nekkid hair clips at a craft store for about $3. 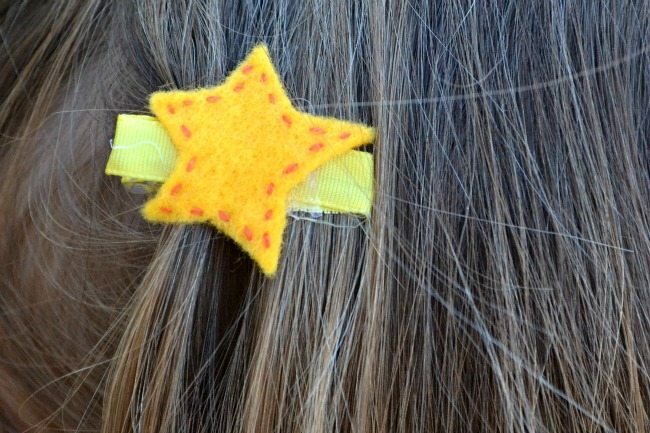 You can use felt, ribbons, buttons, yarn — just about any crafty supplies you have on-hand to decorate the hair clips. And boom! Easy holiday accessories. and just tacked the star to the top with a little more glue. That’s it! Done! I’m a knitter, so I had to include at least one knit hair accessory. 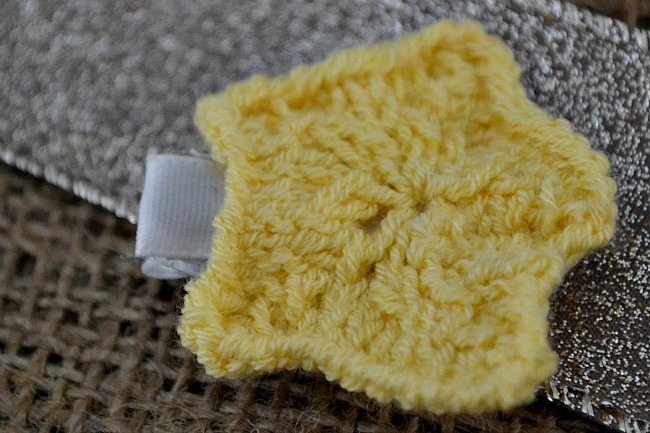 I used this pattern, my size 3 needles, and some DK yarn to whip up a star in about 20 minutes (it’s five rows long so it goes pretty quick!). Lined another barrette with ribbon, glued this to the top, and I had a star barrette in less than half an hour. 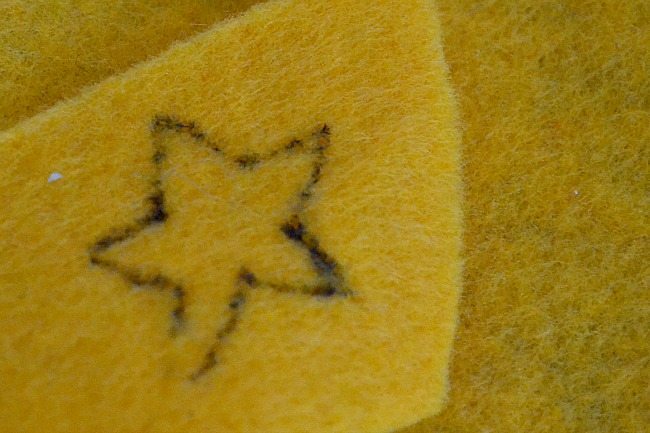 These stars are so cute — they’d also be great as present toppers, or maybe knit with bigger needles and chunkier yarn to string together as a garland. This one was just buttons. I took one large red button, and some smaller green ones (these are from Laura Kelley, she’s got some awesome button collections!). I glued them to the back in a circle and let the whole thing dry. When dry, I glued my button wreath to a ribbon-lined barrette and that was it. 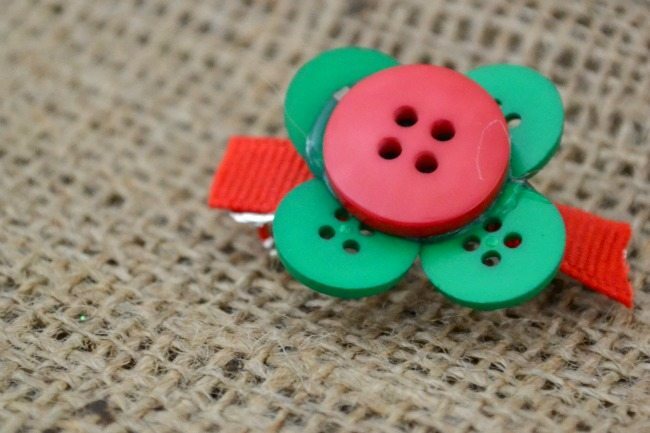 One tip for gluing with buttons, though — if you want it to last a while, don’t use the glue gun. Try an all-purpose adhesive like Quick Grip, or a glue intended for plastics and jewelry. The buttons glued on with a glue gun tend to pop off pretty easily. 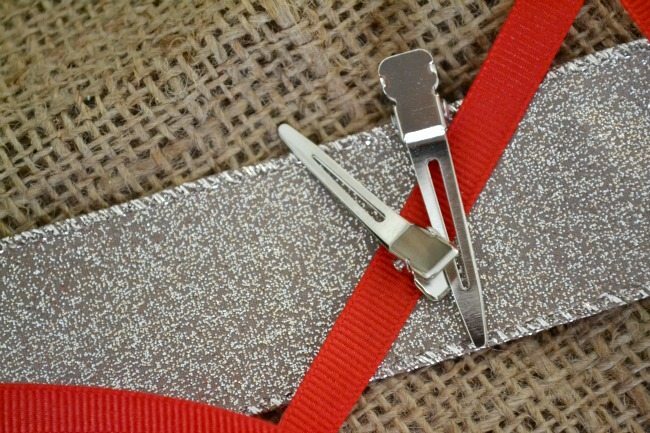 So there you have it — three simple holiday hair clips to make things a little more festive! And I’d love to connect with you on Facebook, Instagram, and Pinterest as well!